Bikini Atoll is a group of 23 islands in the Pacific that is forever linked with the nuclear age. 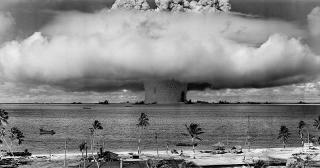 Between 1946 and 1958, twenty-three nuclear devices were detonated at Bikini Atoll by the USA. The local inhabitants were displaced and the tests had major consequences on the geology and natural environment of Bikini Atoll and on the health of those who were exposed to radiation. In 1968 the United States declared Bikini habitable and started bringing a small group of Bikinians back to their homes in the early 1970s as a test. In 1978, however, the islanders were removed again when strontium-90 in their bodies reached dangerous levels after a French team of scientists did additional tests on the island. Prior to the explosion of the first atomic bomb on the island, the lagoon at Bikini was designated as a ship graveyard after World War II by the United States Navy. Today the Bikini Lagoon is still home to a large number of vessels. ICOMOS advised Referral, to "Draw up an inventory of the land-based properties that contribute to the value of the property; inscribe the most important of these on the national historic sites list;"
Built or owned by Japanese: "In the early 1900's the Japanese began to administer the Marshall Islands.... The Bikini islanders' life of harmony drew to an abrupt close when the Japanese decided to build and maintain a watchtower on their island to guard against an American invasion of the Marshalls."